Transatlantic budget carrier Zoom Airlines has suspended all flights and is applying to go into administration. Thousands of passengers due to fly with Zoom have been told to rebook with other carriers, and to contact credit or debit card issuers about refunds. Earlier, two of the airline's jets were held at Glasgow and Cardiff airports. UK-Canadian Zoom blamed its problems on the "horrendous" price of jet fuel - which had added $50m (£27.3m) to annual fuel bills - and the economic slowdown. Zoom, which has flown since 2001, employs 450 staff in Canada and 260 staff in the UK. It operated flights from London Gatwick, Glasgow, Manchester, Cardiff and Belfast, as well as Paris and Rome. And it flew to eight destinations in Canada, New York, San Diego, Fort Lauderdale and Bermuda. Zoom's co-founder Hugh Boyle told BBC News he "did not hold much hope" of finding new investors to salvage the company. "We are very, very sad and disappointed that we thought we could pull through this very difficult situation," he said. "We had some financing in place, but sadly it didn't come quick enough to avert some of the creditors who came in today to seize one of the planes, which resulted in a domino effect of the situation that we're faced with". In a statement, Mr Boyle and his brother John said they "deeply regretted" having to suspend all Zoom operations. "It is a tragic day for our passengers and staff," they said. "We are desperately sorry for the inconvenience and disappointment that this will cause passengers and those who have booked flights. "We have done everything we can to support the airline and left no stone unturned to secure a re-financing package that would have kept our aircraft flying." They added that hopes of securing a new investment package to ensure future operations had failed, meaning administration procedures had to begin. Zoom said BA and Virgin Atlantic were offering "special" fares for passengers whose flights had been cancelled. The announcement came after one of its planes was detained at Glasgow Airport for non-payment of air traffic control charges. WHAT SHOULD ZOOM AIRLINES' PASSENGERS DO? If your flight is part of a package holiday originating from the UK, you may be able to make a claim under the CAA's Air Travel Organiser's Licence (Atol) scheme. 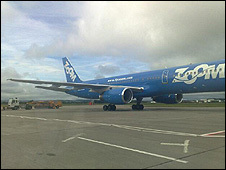 Meanwhile passengers on a flight from Cardiff were told to get off their Zoom plane, which was then impounded. One of the passengers due to fly from Glasgow to Vancouver said he had been told on Thursday morning that there was a "technical difficulty" with the aircraft, and that the plane would not leave until 11pm. 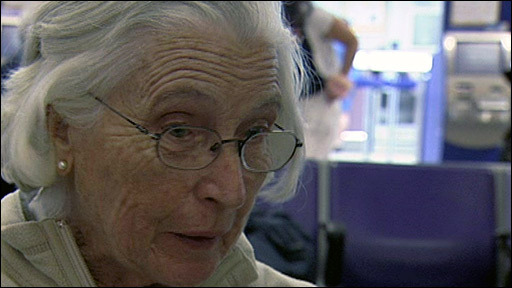 "Then at 7 o'clock the British airport authorities started telling us that Zoom Airlines had entered into administration and basically that we could go home," William Moonie told BBC News. "This was supposed to be a holiday of a lifetime for my wife and I. I've just retired from the fire service after 30 odd years and my wife is 50 this year. "We were going to have a celebration holiday. We were supposed to go on a cruise to Alaska and supposed to go to the Rocky Mountains by train." He added he was hopeful that, because his flight was part of a package holiday, he may be covered by the CAA's Air Travel Organiser's Licence (Atol) scheme. A number of other budget long-haul carriers have gone into administration in recent months, including Hong Kong-to-London carrier Oasis and business class transatlantic firms Eos, Maxjet and Silverjet. The rising cost of oil - which topped $147 a barrel in July - has led to aviation fuel bills soaring. "They had based their business model on oil prices of about $70 or $80," said Simon Calder, travel editor of The Independent. "Once it topped $140 they simply could not cope." He added that "tens of thousands" of passengers were likely to suffer. Airline analysts say that with consumers being more cost-conscious, many were cutting back on luxury spending such as travel.